If you can dream it, you can do it! Here’s a workout that makes you feel like you can fly. In an attempt to reverse the downward spiral of your mental and physical wellbeing, "Self-Help" brings you suggestions for classes, sports, team events, volunteering, and educational stuff that might just pull you out of that boozy tail-spin. 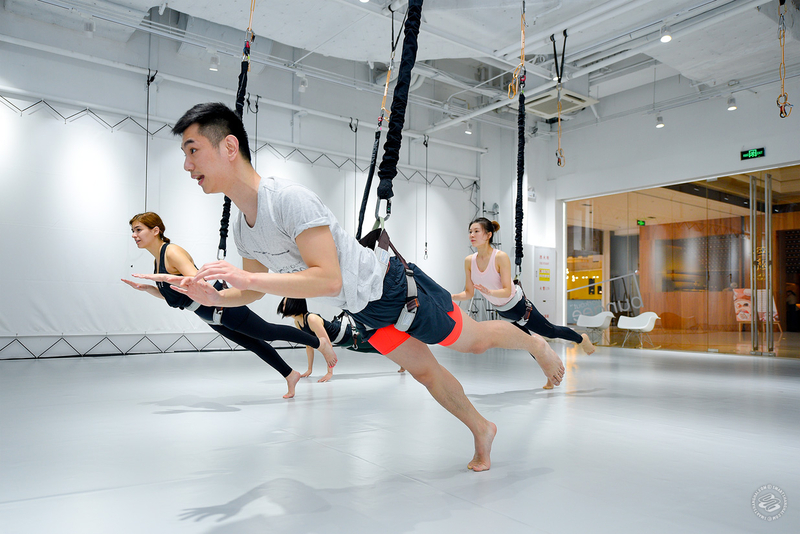 Founded in Bangkok about two years ago, Jumplify is a franchise that’s bringing aerial dance to the masses. It made it to Shanghai just about a year ago in Xintiandi and spread out to a second Pudong location in December. Seems just ridiculous enough to be the next big thing — attach a bungee cord to your body and do some sqauts/dance moves…and it’s like real fun. Forget trampolines! Fly like Peter Pan in a stage production of Peter Pan. It’s reminiscent of aerial yoga…but bouncier. They call it, “a high intensity, core focused workout in a fusion of dance and aerobics.” I call it fantastic. Their main offerings include a 75 minute Bungee Workout which is more dance focused and Bungee Fit, more HIIT and cardio focused, lasting 60 minutes. We tried Bungee Fit. The class starts with a warm up (before you get attached to the bungee) jogging in a circle, squats, jumps, and brief stretching. Then you harness up and strap into one long bungee that shoots out of you like an Avatar tail (VPN). If it’s your first time you put on the spandex equivalent of a chastity belt, thick padded biking shorts to make sure the harness doesn't dig into your legs. Once the harness is on, it's actually a bit difficult to move with the bungee cord attached to you, apparently it takes a lot of core strength (whatever that is). We do a series of movements, that mirror what we did in the warm-up—but now with the weight of an Avatar tail. Squats, and running steps, and jumps. The instructor shows you how to use the tension of the bungee to get more air on jumps. He looked like he was flying, with incredible grace, the closest thing I've ever seen to a human Sky Dancer (VPN). At the conclusion of learning each move, we put them all together in a way that was dance-like, I'd even say Sky Dancer-like. The class concluded with a cool down and stretching. 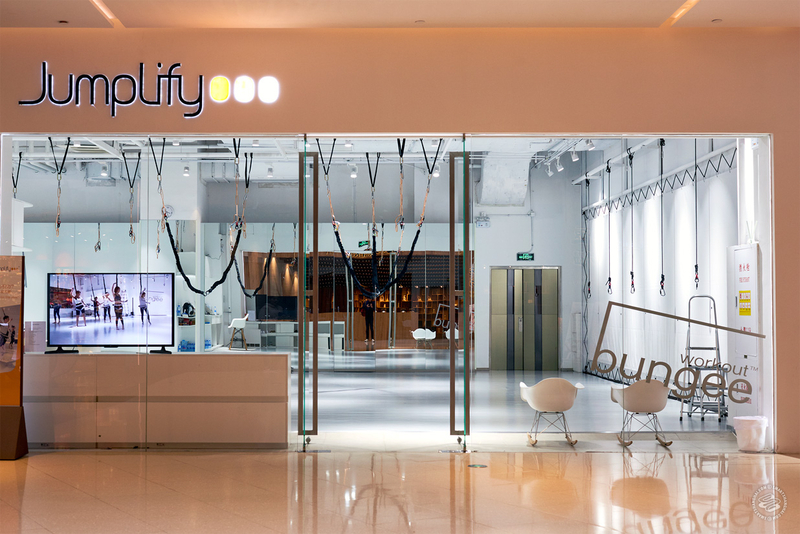 Jumplify also offer classes on their wall, which are meant to be more difficult and take more core strength. Basically, you're suspended in front of a wall on rope (no bungee), and you use the wall to push yourself off, to spin like Spiderman, and hang upside down...like Spiderman. This was the most where it felt like play, mirroring the movements of the teacher, and it actually felt a bit more intuitive than the bungee class, easier to pick up. Not mad at this trend, it’s the kind of workout where you forget you’re working out—which is the best kind right? I think with 1-2 more classes it might get easier to get use the bungee (it’s harder than it looks I swear), probably less time for those with core strength. Either way it was fun, there’s a focus on play, but you’re still quite sore in your legs and abs the next day. Okay, hold on to your bungees. For first time jumpers you can purchase a discounted trial on Dianping which is 268rmb for the 75 minute Bungee Workout, 238rmb for Bungee Fit, and 208rmb for the kid’s classes. After that, it’s 388rmb for BGWO and the wall, and 328rmb for Bungee Fit. Kids classes are for ages 5-7 and 8-10, costs 328rmb per session. You can also buy in bulk: 10 times for 2,580rmb and 20 times 4,000rmb. Yeah not cheap, but they say they’ve got the legit (safe) equipment, which seems important when you're flying through the air. More on their official site and you can check videos from the Shanghai Studio on their Facebook. @JamesWeir those images are available at the Premium membership level.